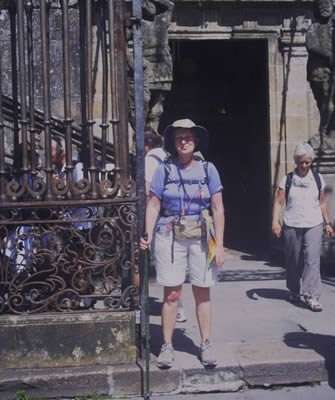 Dear Nigel and Julie - Here I am outside the Cathedral in Santiago de Compostela having walked 500 miles in 37 days - thats an average of 13.5 miles per day which doesnt sound too much really! I only took one full day off from walking, although there was one day where I only walked 3 miles because I had arranged to meet up with 2 ladies from Plymouth who was also walking the Camino. One thing led to another, and we sat in the warm sunshine in the towns Plaza Major, drinking wine. I decided that to walk on in the heat of the day with alchohol on board was not a good idea, so I stayed put and set off again early the next morning. As you can see, what I looked like was of no importance. When you are walking with many people who look as scruffy and mucky as you do, it really doesnt matter. It is more important to keep cool and comfortable. Washing and drying clothes in the sometimes very limited facilities was quite a challenge but does make you appreciate washing machines, hot water and fabric conditioner. I am very glad that I was able to walk across such a beautiful country and experience all the joys and challenges that I did, and to also raise some much needed funds for Ellies Haven. I was deeply touched by all the people that sponsored me and hope that they continue to take an interest in your project.